Talk given to the Transparency Task Force on 20 January 2019. Is there really such a thing as passive investment management? It sounds like an odd question to ask, given the meteoric rise of passive investments over the last 30 years or so. We are all familiar with passive funds, ETFs, investment strategies etc. But let’s take a step back. Prior to any investment being made, the asset owner has to decide how to structure their investment portfolio. This is an active investment decision, regardless of whether the chosen strategy is an active, passive or a mix of the two. Then from time to time, the asset owner monitors their portfolio, and interves where necessary just as an active manager might reconsider which assets to hold. So while passive investment management of course exists, it exists in a greater, active space where humans are making investment decisions. And this is where it gets tricky for the asset owner, especially one who likes to shoulder as little responsibility as possible. Many large schemes, like pension funds, appoint consultants to advise on their investment strategy. This involves defining benchmarks and inviting investment managers to bid for the investment mandates. Given that nobody wants to get fired, what often results is a kind of herd mentality, where benchmarks from major providers and proposals from established investment managers are more likely to be recommended than a more niche proposition. So if anything goes wrong, well, as a someone once said, “we’re all in this together”. Nobody has ever got fired for recommending an A-list provider. What do we look for when choosing passive investments? It’s hard to escape from the low fees discourse when choosing passive fund management. After all it’s become rather an IT exercise whether it’s tracking a benchmark index or something far more complex like multi factor smart beta model. Costs, however, can only go so low. Laws, regulations, risk and governance themes are a necessary yet costly administrative burden. Further, the introduction of non-executive directors adds further to the cost of the payroll, although I believe their supportive scrutiny should help asset owners. Because the choice to go passive isn’t just about fees, it’s about a lack of confidence in active managers. When I started in the passive fund business, index tracking was only just taking off. The accusation was that active managers were not consistently outperforming markets, and that those that were, were most likely just lucky. So essentially the question asked was: Why pay active management fees for market returns? The decision on “which benchmark” starts to become at least as important as “which manager”. Third, are there alternative strategies? Why stop at market indices? When passive management started eating into the active management space, managers told us that some asset classes didn’t lend themselves to indexation. For example, the small-cap market was deemed inefficient and active managers could therefore always beat an index. So we created indices specially for them. And guess what? They couldn’t always beat them. After small caps, we had yield, and we had value and growth indices, and fundamentally weighted indices. 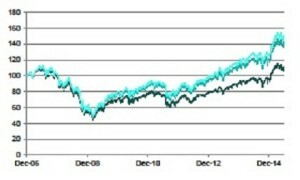 And by about ten years ago a whole raft of strategies collectively known as “smart beta”, each offering a particular twist on structuring portfolios, and each demonstrating that they have good long term outperformance over the market index on which they are based. These strategies were often sold along the lines of: Active returns at passive prices. outperform and half would underperform. In fact we’d be back to active management again, with asset owners tactically switching between passive strategies according to their macro-economic view of markets. That said, Research Affiliates did a study using randomly generated portfolios, and almost all of these outperformed. They then demonstrated that all smart beta strategies outperformed as did inverse strategies where stock weightings should have delivered sub￾market returns. Why? Because they harnessed stock price mean-reversion in their re￾weighting of assets. Of course that pre-supposes that mean-reversion is a strategy that delivers out-performance. Which under their period of investigation, it did. The take-home from this part is probably that smart beta strategies are better used for delivering specific objectives, such as high income or low volatility, than as a strategy where better-than-market returns are required. consider whether any smart beta strategies more closely align with their investment obligations rather than simply tracking a market index. The new kid on the block is artificial intelligence. Back in the 1980s index tracking was accused of being “black box”. Then when people got used to that, factor models like Barra became black boxes. What would these people make of AI? More to the point, as a trustee or treasurer, would you trust an algorithm to run your money? I don’t think I would. Yet much as promoters of driverless cars claim that they’re safer than driven cars, why wouldn’t we trust AI more than an active manager? Whatever strategy is chosen, the asset owner must refuse to be seduced into not having to do anything. It’s so tempting to derogate responsibility not only to a consultant but also to an index or a passive fund manager. And then when, like in 2010 when the Deepwater Horizon disaster happened, you find that your biggest holding has lost a third of its value. It’s no good proclaiming to your stakeholders how unfair it is that you have to hold so much BP in your portfolio because of its large size, which some did. It was a choice. I strongly believe it’s important to avoid what Andy called in a recent communication the “rudderless boats with skippers that don’t have navigation equipment”. Asset owners like pension trustees must stay alert to their responsibilities and ensure they have good governance in place to protect their beneficial stakeholders. Where does that leave active management? Active managers tend not to sell their services on the basis of low fees. Net total returns is more where they are at, happy to justify their higher costs because they deliver superior returns. But that doesn’t stop their taking positions close to index, known as closet tracking. How many global mandates will have around half their assets in the USA for example? And how risky would it be to hold nothing in the largest companies? Can blame benchmarks for this? Or is it those expedient asset owners specifying that they want MSCI All-World plus half a percent, or something. So can active managers beat the market? According to Efficient Market Theory, it’s impossible, on average, to beat the market. At least not without cheating. Because the theory goes that each asset’s price represents everything that’s known about that asset. Some active managers do seem to know how to harness research. Especially their own research, rather than that provided by banks and brokers. And with each piece of new research, they can’t simply apply some quantitative tests. They have to formulate new theories as to why a particular investment decision is appropriate to deliver return. We’re now in a highly under-researched world of intuition, emotional intelligence, unconscious processes and what Daniel Kahneman calls “Type 1 thinking”, the sort of thinking that precedes logic. Because if it was purely logical, then a machine could do it. And despite the active manager describing the logical steps that led them to an investment decision, this is often a justification rather than a deduction. We might find ourselves resistant to the idea that our active manager has intuition. This is the modern age, after all, and everything has to be scientific. Think of it like the grand master chess player making a move, rather than the supercomputer processing billions of outcomes. Active management has an important role to play in a number of niche areas too. Impact investing is one, where funds are targeted not just to produce a return but also to finance activities that align with the values of the investor. Ethical and faith investing is another, although to some extent these can be done passively. And for the foreseeable future, active management will always find a place with private equity, infrastructure funds, real estate and other activities which rely on the management of illiquid assets. So, to conclude, what has passive investing given to asset owners? It has certainly given active management a kick up the backside. And with ETFs, it has broken into territories largely impenetrable to active managers. It has brought costs down, and if market returns or are all that’s required, then that’s got to be a good thing. It’s innovated into the active space with smart beta and, who knows, AI may yet find its place in the great scheme of things. Active management, meanwhile, has had to raise its game. It can’t compete on fees. It has to prove it can produce long term performance above benchmark, or take refuge in asset classes where passive funds have no participation. And as I was writing this talk, I wondered whether AI might one day negotiate property deals, raise shareholder resolutions or take major stakes for private equity funds. Maybe nothing is sacred!